Cucumber juice comes from cucumber, an edible vegetable. Cucumber belongs to the melon family, which includes the watermelon, squash and zucchini. Other than drinking its juice, cucumber can be combined with various dishes, eaten with a salad and used as skin agents. Drinking cucumber juice can provide you with several health benefits. Drinking cucumber juice can provide you with a good quantity of vitamin A. 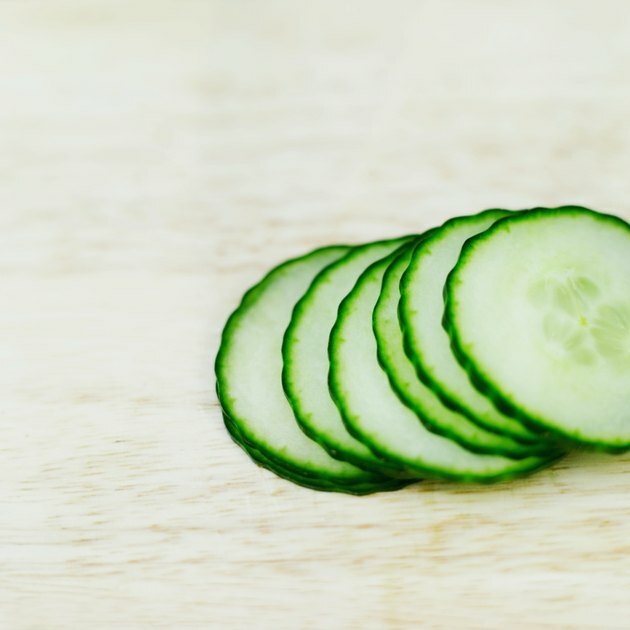 According to the United States Department of Agriculture - National Nutrient Database for Standard Reference, cucumber juice that comes from raw cucumber either peeled or unpeeled contains 86 to 109 IU of vitamin A per serving. Vitamin A is a fat-soluble vitamin and antioxidant that plays an important role in helping you with your eyesight, bone growth, reproduction and cell division. Vitamin A that comes from plant sources are called provitamin A carotenoid, while those that come from animal sources are called preformed vitamin A. Sufficient amounts of vitamin A can also help promote healthy and intact surface lining in the eyes, respiratory tract, urinary tract and gastrointestinal tract. Taking cucumber juice increases your level of dietary fiber intake. The Centers for Disease Control and Prevention reports cucumber juice as a good source of dietary fiber. Taking adequate levels of dietary fiber helps you with digestion and weight control. Consuming a high-fiber diet can also help prevent constipation, colon diseases and hemorrhoids. Other important health benefits of dietary fiber include normal bowel movements, healthy blood cholesterol levels and controlled blood sugar levels. Drinking cucumber juice can result in the development of strong and healthy bones and teeth, thanks to its vitamin K content. According to the USDA – National Nutrient Database for Standard Reference, a serving of raw and unpeeled cucumber contains 19 percent of the recommended daily vitamin K intake for women and 14 percent for men. Vitamin K also promotes healthy circulation by controlling the thickness of your blood, so you won't suffer excessive bleeding or bruising, which can interrupt blood flow. Consuming large amounts of cucumber juice can help you with blood volume and blood pressure regulation. The USDA states that one serving of raw peeled cucumber contains 2 milligrams of sodium, while raw unpeeled cucumber has 6 milligrams. Sodium helps the body with maintaining normal blood pressure and blood volume levels. Your nerves and muscles also need sodium to function properly. Too much sodium can potentially lead to fluid buildup and high blood pressure. What Are the Benefits of Celery & Cucumber Juice?